Have you ever noticed how some court reporters are able to turnaround transcripts much quicker than some others? Whether they are able to have a rough draft transcript ready shortly after the end of a deposition or a final transcript available the next day, they seem to be better and more efficient at creating a quality transcript. If you’re an attorney or paralegal, this article explains how some court reporters are able to work more efficiently than others. If you’re a court reporter, you might be interested finding out if there is cutting-edge software you might not be taking advantage of or simply ready to take your career up a notch? Realtime reporting is a way to use the latest technology to ensure client satisfaction and maximum productivity during time spent in the courtroom. With realtime reporting, attorneys are able to see what is being transcribed by the court reporter instantaneously during the deposition or legal proceeding. Working as a realtime reporter provides many benefits, such as a quick turnaround of transcripts, working with a knowledgeable team, and also, technical support that is readily available should any problem arise. Eclipse software offers the Connection Magic tool, which connects realtime reporters and their team of trained scopists and proofreaders online during the course of a deposition or court proceeding to work simultaneously on a transcript. The steps for connection are straightforward and allow for the most efficient turnaround of a deposition transcript. Using advanced Connection Magic technology, a team of scopists can listen to a deposition or court proceeding and edit the reporter’s transcript virtually instantaneously, and the final proofer can work directly behind the scopists, without ever having to step foot in the actual deposition room or courtroom. Simply put, Connection Magic creates a unique way to bridge the gap between the spoken word and its translation into a transcript of the legal proceedings. Well, what is a scopist? Scopists are trained professionals who have undertaken course study to enable them to not only use official court reporting software, but to actually read and follow along with the steno notes the court reporter is inputting. The scopist researches carefully to ensure the correct spelling of technical words, proper names, and legal citations that might come up in a transcript. This is often compounded with the fact that on any given day, the subject matter can vary from a simple car accident/whiplash case, to patent infringement, to medical malpractice, to any subject matter, no matter how complex, that a lawsuit may be based upon. Scopists are expected to not only do the research, but to place the proper punctuation marks throughout the transcript, as well as ensure the correct spellings of technical words, and the correct usage of homonyms and possessives and all of the other intricacies of the English language. This is especially challenging during a Connection Magic session as the scopist is also trying to stay literally “live” with the court reporter to ensure a seamless product by the end of the day. Connection Magic is a feature on Eclipse software that allows the reporter to set up a “room” while transcribing the deposition and then share the transcript they are working on to an online platform. Scopists can then log-in to the Eclipse software on their own computers and choose to enter this “room” with a password set up by the reporter. From this point forward, the court reporter and the team can work simultaneously on the transcript with very little communication involved. The team will be able to hear the audio in real time and follow along with the court reporter’s notes of the deposition or court proceeding as it is happening live. Likewise, the reporter can see the scopists’ editing marks, leave notes for the scopists, and form an idea of the pace at which the scopists are editing the file and when a file will be complete, as this varies from file to file depending on performance, witnesses, research and many other factors. This collaboration can result in a clean transcript within hours of the conclusion of the deposition or court proceeding and allows the reporter to deliver a same-day or next-day copy of the transcript to clients. 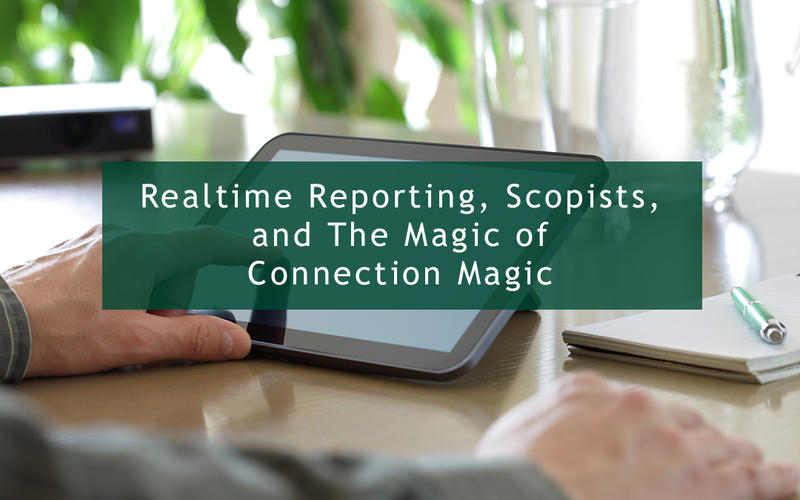 The “magic” behind this feature is it allows the reporter and scopists to work as a team to deliver a finished product in record time, resulting in increased profitability and the ability to meet the deadlines and fulfill the needs of all clients. In another article, we discuss 3 Tactical Advantages of Video Depositions for Attorneys. Alexandra Giardina is a teacher, freelance writer, and certified scopist and proofreader for Reporter’s Choice, LLC. She has a passion for language, learning, and inspiring others through creative writing.